I’m still enjoying not having to go into the museum. I am going to have to go to put in my resignation, however. In the meantime, I’ve been working on a sketch for a larger drawing. 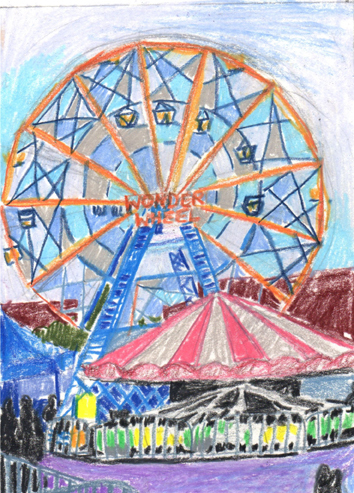 This is the Wonder Wheel at Coney Island. I think in terms of magic lands, so popular in literature and myths. What’s more magic than an amusement park? Of course, many of my drawings are available as prints and notecards at Zazzle.